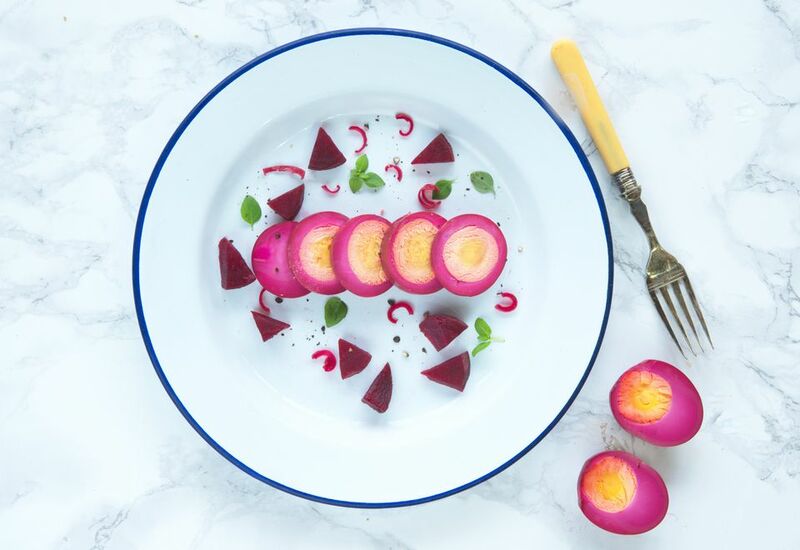 Create a show-stopping, super-tasty addition to your salads and sandwiches, or dress up a plate of meats and cheeses with these beet deviled eggs. These beet deviled eggs are much easier to make than they look, and not only will you have these tasty bites ready to serve in 3 to 4 days, you'll have pickled red beets as well—a double delight! These eggs can be served in a variety of ways. Present them whole for a picnic or lunchbox. Halved or quartered, they look and taste lovely as a side dish for cold meats and cheeses or in a salad. Or slice the eggs thinly and place on open sandwiches garnished with a little of the pickled shallot and the cubed beets. Bring a pan of cold water to a boil. Add the eggs and cook for 10 minutes. While the eggs are cooking, prepare a large bowl of cold water with a handful of ice cubes. Once the eggs are cooked, drain carefully, then immediately plunge into the cold water to stop the cooking process. Let the eggs chill completely, then peel. Place the eggs in a 24-ounce wide-mouth preserving jar. Bring to a boil, then lower to a simmer for 5 minutes. Leave to stand for 2 to 3 minutes, then pour the vinegar mixture over the eggs. Add the diced beets. Seal the jar and leave to cool. Pop the jar into a cupboard for 3 to 4 days to allow the eggs to pickle, though they will keep for 4 weeks unopened and 3 weeks opened (as long as you keep in the refrigerator). The eggs will firm up in the brine, and turn a deliciously pretty pink hue. It's the use of beets that make this such a spectacular recipe, but you can alter the color to a vivid yellow with a subtle curry flavor as well. Use the apple cider vinegar as before, but add 2 tablespoons of mild curry powder, 2 teaspoons of turmeric, and keep all other ingredients the same. Change the spicing by adding 2 or 3 cloves, a cardamom pod, and a small stick of cinnamon for a warmer spice. Switch pink peppercorns for the black for a milder pepper flavor. Use red wine vinegar, which will impart a deeper color.